3/4 cup of leftover Rice-a-roni (230 calories), 1.25 oz. canned tuna (40 calories), 1 oreo (50 calories). Rice-a-roni tastes pretty bad as leftovers (even when you make it on a stove at home). For some reason the moisture evaporates and leaves the rice seeming undercooked. I was also kind of sick of the rice flavor by this afternoon, and I ended up giving a good deal of my portion to Greg haha. Having oreos around is kind of being detrimental to my eating habits, because when it's there I just want to have some, especially after a meal of salty stuff. Ack. Remaining 1/2 of the chicken salad sandwich from yesterday (220 calories). I think Greg and I are going to order out again for dinner (sigh, wish we had more options). Maybe we'll get Chinese today. Anyway, the 1/2 sandwich is for keeping me from starving to death until we order lol. White rice (2 cups, 400 calories), 5 oz. lobster sauce (175 calories), 6 oz. sesame chicken (350 calories). Yum. I haven't had Quan's lobster sauce in a long time. It's a thick sauce with ground pork, eggs, and Chinese black beans in it, plus lots of corn starch and some soy sauce for flavoring and consistency. Very cheap (1 quart costs $6.50, and lasts more or less 6 meals if you are eating by yourself), but you are mostly eating sauce anyway lol. We were originally going to order Quan's grilled lemongrass chicken, which is very fragrant. But they had run out of it, so I had to make a spur of the moment decision to switch to sesame chicken, which is really different. In the end though, the two entrees balanced each other out quite well, since the lobster sauce is salty, and the sesame chicken is sweet. 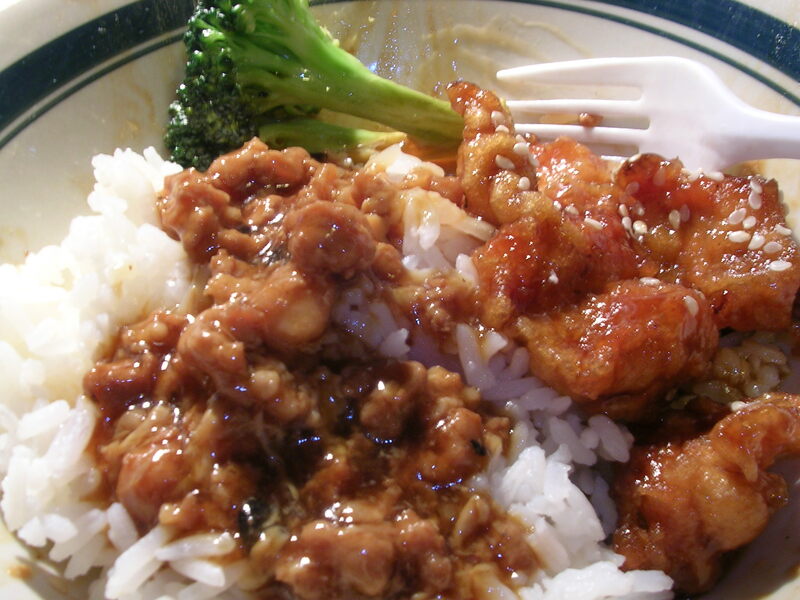 In the picture, the lobster sauce is piled on the rice on the left, and the sesame chicken, adorned with sesame seeds, is on the right. Total for today is about 1715. Really cutting it too close. This whole business of having no access to healthy food and being stressed out at the same time is doing wonders for me. This entry was posted on Monday, March 26th, 2007 at 11:04 pm	and posted in American, Chinese, pork, rice and pastas, snacks, Uncategorized. You can follow any responses to this entry through the RSS 2.0 feed.